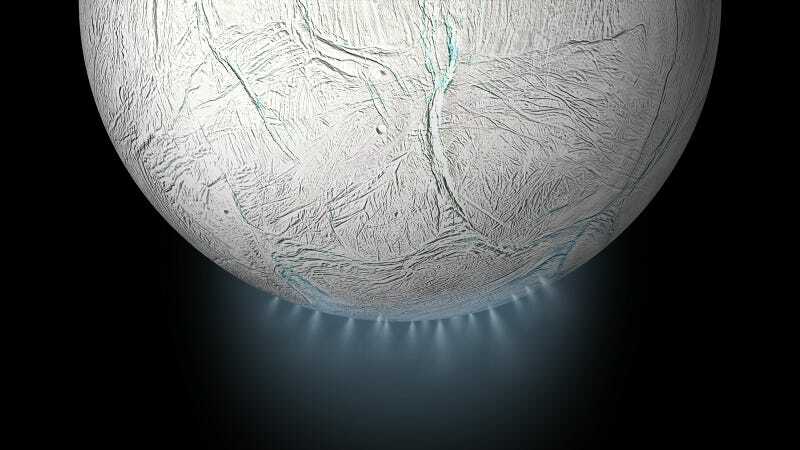 Illustration showing plumes on Saturnian moon Enceladus. It looks like NASA will offer billionaire entrepreneur and physicist Yuri Milner help on the first private deep-space mission: a journey designed to detect life, if it exists, on Saturn’s moon Enceladus, according to documents acquired by New Scientist. The teams will be working in the project plan and concepts through next year, New Scientist reports. Icy moons orbiting Saturn and Jupiter are intriguing candidates for alien life. Jupiter’s moon Europa has evidence of water in the form of plumes spewing water vapor out of cracks in its icy surface. Representative John Culberson (R-Texas), who was recently voted out of office, was a strong proponent for a NASA mission to this icy world. Enceladus specifically has evidence of a warm ocean and complex organic molecules, according to Cassini data, though it orbits Saturn, which is farther from Earth and Jupiter. Perhaps life has evolved beneath the ice around heat spewed from volcanic vents, as some animals have done in Earth’s deep oceans. The Breakthrough Initiatives project seeks to answer the deepest questions about space, including whether we’re alone in the universe. Its board includes billionaires Yuri Milner and Mark Zuckerberg, and formerly physicist Stephen Hawking, who passed away in March. It lists mission concepts like a solar sail to reach nearby stars, developing the technology to find Earth-like exoplanets, and sending out a message meant for aliens, similar to the Arecibo message. New Scientist reports that Breakthrough Initiatives would lead and pay for an Enceladus fly-by mission, with consulting from NASA. Gizmodo has reached out to NASA and Breakthrough Initiatives for comment and will update this post when we hear back. What Would Life On Saturn&apos;s Moon Enceladus Look Like?